The Content Marketing Award presented to Guitar Center. Pictured L-R: Joe Pulizzi, Founder, Content Marketing Institute; Dustin Hinz, VP of Brand Experience & Entertainment Marketing, Guitar Center; Lee Diskin, Manager of Video Production, Guitar Center; Matt Petersen. CEO, McMurry/TMG. 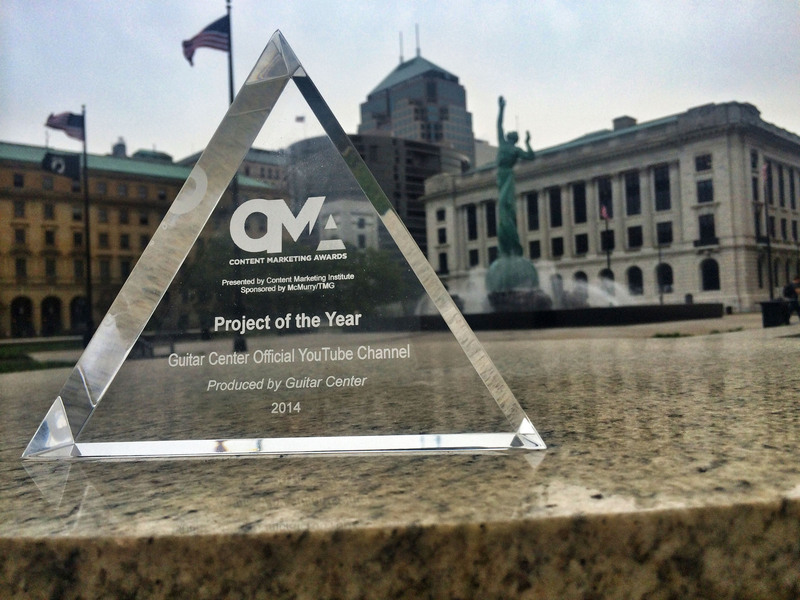 Los Angeles, CA (September 11, 2014): Guitar Center, the world’s largest retailer of musical instruments, is proud to announce that it was presented with three 2014 Content Marketing Awards, including the Award’s highest honor, Project of the Year, for its exceptional YouTube channel. The retailer beat out thousands of top-tier brands for this distinction, and was named winner out of six finalists including Target, Four Seasons, and General Electric. Additionally, Guitar Center’s YouTube Channel received a Gold Award in the category of Highest Subscriber Growth and a Silver Award in the category of Best Use of YouTube for Content Marketing. These are Guitar Center’s first Content Marketing Awards. 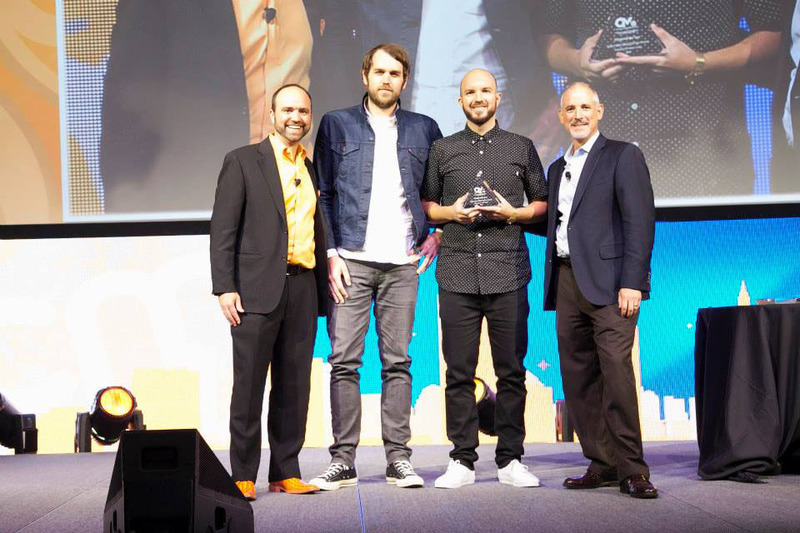 Project of the Year finalists were announced last month and Guitar Center was named overall winner on September 10, at Content Marketing World 2014, the largest content marketing event in the world, with over 2,500 marketers from 50 countries in attendance. This places Guitar Center on an impressive list of Content Marketing Award winners, including Volkswagen, the Walt Disney Company, Unilever, Google, and many more. Guitar Center is the world’s largest retailer of guitars, amplifiers, drums, keyboards, recording, live sound, DJ and lighting equipment, with more than 260 stores across the U.S. 2014 Marks the milestone 50th anniversary of the Guitar Center Brand as we continue to help people make music from coast to coast. In addition, the Music & Arts division operates more than 120 stores specializing in band instruments for sale and rental, serving teachers, band directors, college professors and students since 1952. Guitar Center as we continue to help people make music. With an unrivaled in-store experience and passionate commitment to making gear easy-to-buy, Guitar Center is all about enabling musicians and non-musicians alike to experience the almost indescribable joy that comes from playing an instrument. All we sell is the greatest feeling on earth. The Content Marketing Awards, presented by the Content Marketing Institute and sponsored by McMurry/TMG, launched in 2004. It is the largest awards program in North America for people who create content for organizations. The Content Marketing Institute is the leading global content marketing education and training organization. CMI teaches enterprise brands how to attract and retain customers through compelling, multi-channel storytelling. CMI's Content Marketing World event, the largest content marketing-focused event, is held every September, and Content Marketing World Sydney, every March. CMI also produces the quarterly magazine Chief Content Officer, and provides strategic consulting and content marketing research for some of the best-known brands in the world. CMI is a 2012, 2013 and 2014 Inc. 500 company. Photo caption 1: The Content Marketing Award presented to Guitar Center. Photo caption 2: Pictured L-R: Joe Pulizzi, Founder, Content Marketing Institute; Dustin Hinz, VP of Brand Experience & Entertainment Marketing, Guitar Center; Lee Diskin, Manager of Video Production, Guitar Center; Matt Petersen. CEO, McMurry/TMG.